Technology Preview (Alpha) playable now free. Imagine if life were possible in a universe with only two dimensions of space. Namiad is a being who lives in a garden on the edge of a circular planet in 2DWORLD, or Planiverse. This computer program has established a control link to this creature's nervous system via radio waves that vibrate between our universe and his. 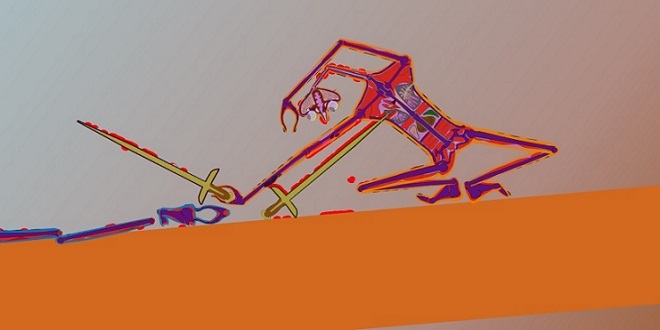 From the third dimension, you can see inside his body and under the ground so use the keyboard and mouse to control him and vehicle handles that he can grab. This game technology preview is the product of many years of research, investment, and development. While its far from complete, its already very playable. We hope you enjoy it and we appreciate your support and feedback. Kontrol is the first video game we know of which makes use of 100% physical modelling of individual body parts for all creature propulsion and balancing, on uneven ground. This is "ragdoll physics" taken to the next level. To achieve this level of realism and natural-looking motion, we've had to develop our own animation system. 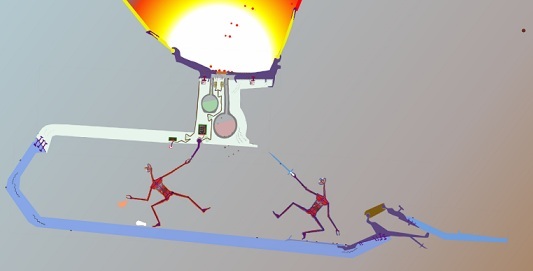 The creatures are walking by the simulated action of their feet to the ground, unlike characters in all other games which merely pantomime using their limbs for locomotion. Guaranteed different experience every session. Self-stabilizing and leveling legs. You may need to time his steps carefully in some spots, but the creature does pretty well balancing on its own. Encounter Artificial Intelligence-driven enemies. Choose to fight them toe-to-toe, trick them, or try and trip them up with something. Discover new moves and combinations using your hands and legs. Raise your front arm to alter the gait, grab and eat food, throw objects, control devices and vehicles, have adventures. Since it is also a two dimensional toy universe simulation, things can go wild, and replays are always different. We are continually expanding this world using our custom tools. Try the Free Trial first before purchasing to be sure it runs on your system. For adequate gameplay speed, the minimum system requirements ae Windows XP, Vista, Windows 7, Mac OS X Snow Leopard, Mac OS X Lion on a system with a Dual 2 GHz processor. If you encounter any Microsoft Silverlight Issues, try a different browser. If having to install Silverlight, you may have to close all brower windows then retry, or you might even need a reboot on some systems. Use Internet Explorer, (type iExplorer in Start), or Safari in Mac. Silverlight is now blocked in CHROME, and it will tell you to install Silverlight forever. Plays on PC and Mac OS X under Microsoft Silverlight.